Hi Everyone, I love sharing recipes that are garden-inspired, after starting my garden this past Spring. 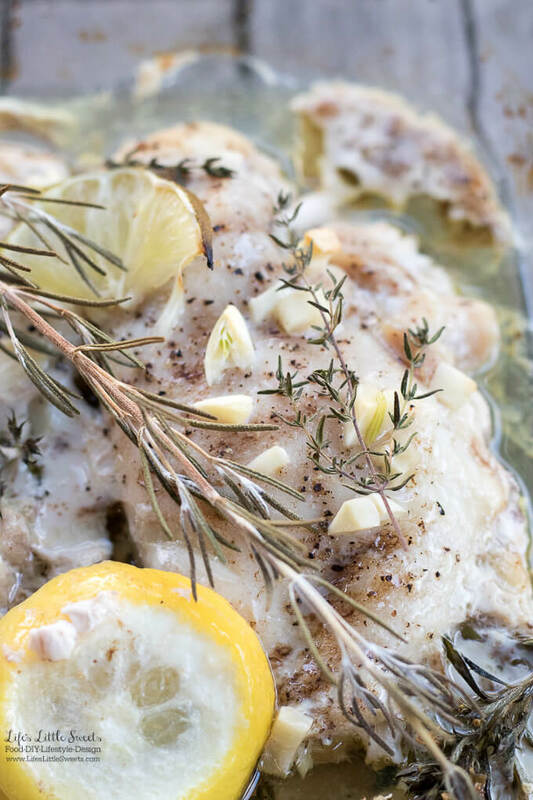 This Citrus Garlic Herb Baked Chicken Thighs uses lemon, lime, garlic, plenty of herbs like Winter Savory, Thyme and Rosemary. I love having this main dish with rice (I love to drizzle the chicken marinade juice on the rice!) and a simple garden salad. 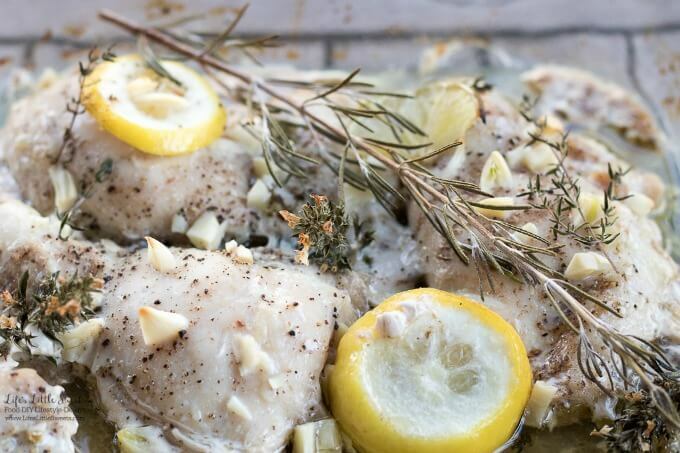 If you are looking for a good salad recipe to go with this Citrus Garlic Herb Baked Chicken Thighs, check them out here. Citrus Garlic Herb Baked Chicken Thighs all marinated and ready to be baked. 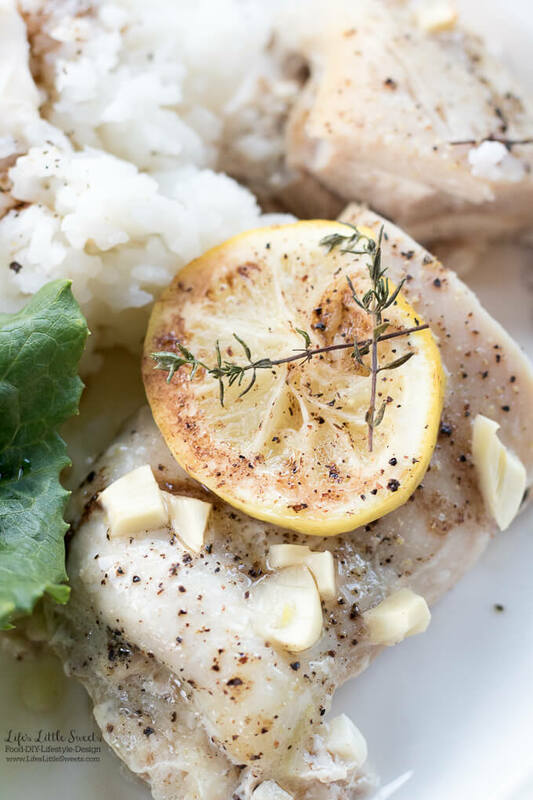 I love Winter Savory, it’s similar to Thyme and it has a scent that is so interesting, I knew it would be perfect for this Citrus Garlic Herb Baked Chicken Thighs recipe. Eric’s dad Michel, grows it in his garden in LBI and now I am convinced that I need to grow it too in my garden at home. 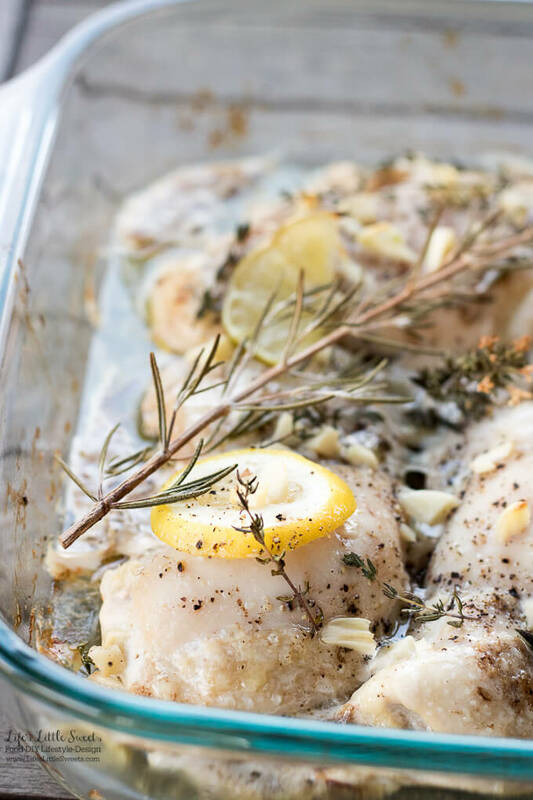 This Citrus Garlic Herb Baked Chicken Thighs uses olive oil, Balsamic vinegar and optionally, you can dot the top with butter (for butter flavor). 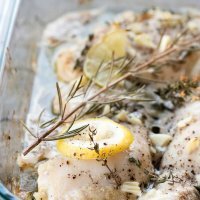 I know you will love this delicious Citrus Garlic Herb Baked Chicken Thighs recipe! Mix all the prepared marinade ingredients together with the chicken thighs. You can put everything in a Ziplock bag and refrigerate for at least 1 hour. 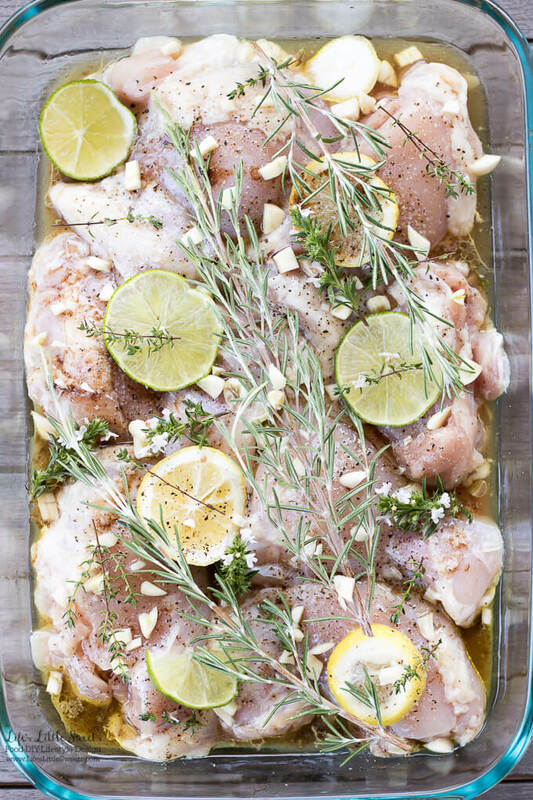 You can also just put everything in the baking dish that you will bake the chicken in and cover with plastic wrap and refrigerate 1 hour or overnight. After the chicken has been marinated. Preheat oven to 350 degrees F.
Bake for 30 minutes. 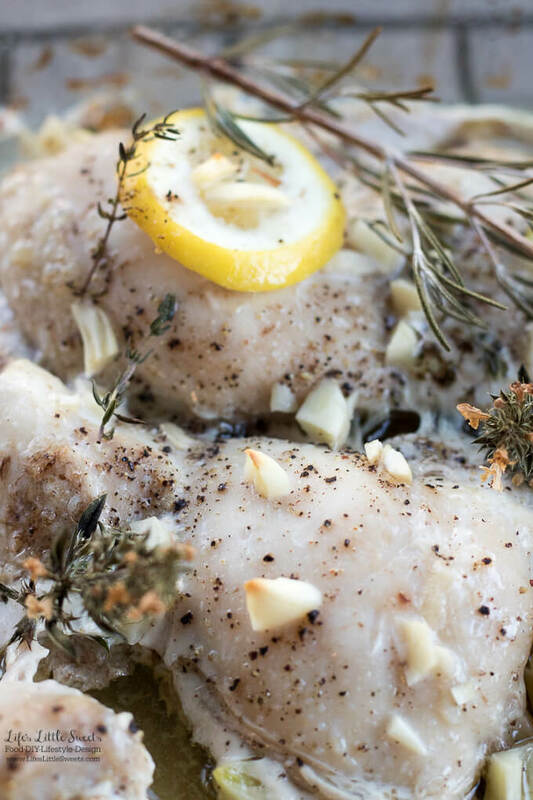 You can also bake chicken thighs at a higher temperature like 400, 425 or even 450 degrees F for 20-25 minutes respectively, the higher temperature will burn up the herbs so that's why I recommend 350 degrees for longer which cooks the thighs through and leaves them juicy. So, if you do the higher temperature, make sure you remove the herbs or have them covered by the thighs or submerged in the marinade. Enjoy with your favorite sides! The safest way to check for doneness is by using a meat thermometer, the internal temperature of chicken thighs should be 165° Fahrenheit (75° Celsius).